August was Hispanic Heritage month and the Four Seasons Scottsdale at Troon North celebrated August 12-14, 2016 with a weekend of culinary festivities and guest amenities, from Friday evening's mezcal tasting to Sunday's Oaxacan Industry Brunch. The main event took place Saturday night, when Executive Chef Mel Mecinas was joined by his brothers Chef Honorio (Gordon Ramsay Pub in Las Vegas) and Pastry Chef Juan (La Patisserie in Los Angeles) in the kitchen for an amazing dinner at Talavera. Visit this link for a photo recap. I began my weekend at the Four Seasons on Saturday afternoon with culinary demonstrations led by Talavera Chef de Cuisine Sam Sanz and Banquet Chef Manny Calderon. Our dishes would be paired with Azunia tequila cocktails. Chef Sam showcased the flavors of her hometown of Nogales in the Mexican state of Sonora. with a family recipe for smoked marlin and queso (cheese) empanadas. The crispy masa pies were stuffed with a delicious filling seasoned with onions, chiles, tomatoes, and cilantro, and garnished with a traditional nopales (cactus) salad. "They're rich in fiber, and this salad is really refreshing and nice for the summer." 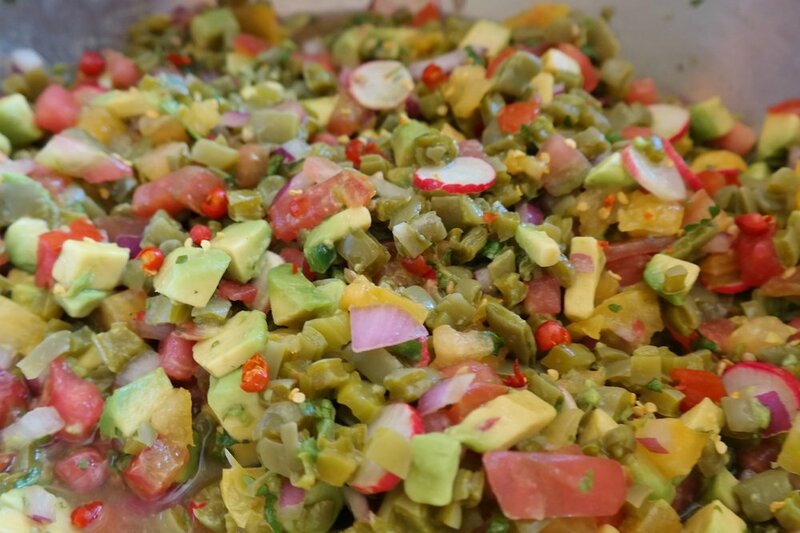 Based on her grandmother's restaurant recipe, diced tomato, onion, radish, and avocado were tossed with a bright cilantro-lime vinaigrette. Chef's Sam's wonderful empanadas were complemented by a fresh and bright cocktail made with Azuñia blanco tequila, Chareau aloe vera liqueur, honey, lime and cucumber juice. Chef Manny represented his hometown of Valladolid with the regional Yucatán dish of cochinita pibil - pork marinated with achiote, a paste of annatto seeds, garlic, onion, oregano, cloves, and bay leaves, and sour orange juice, wrapped in banana leaves, and cooked low and slow for five hours. The earthy, rich pork was wrapped in a tortilla and accompanied by traditional pickled onions, and was paired perfectly with a sweet and spicy Azuñia tequila cocktail made with Ancho Reyes chile liqueur, guava juice, and dried orange. After a fun and educational afternoon, we strolled back to our room, where we were greeted with chips and Chef Mel's exclusive salsa, along with samples of his mole rub, sotol and mezcal, and take-home recipes. We sipped, noshed, and admired this beautiful Sonoran desert view as we relaxed before our dinner reservations at Talavera. Click on the picture below for photos of our special evening. I was hosted by the Four Seasons and my experience was complimentary.